Some time ago I showed you summer cycling in Utrecht but that was in a park in the afternoon. Not exactly rush hour. 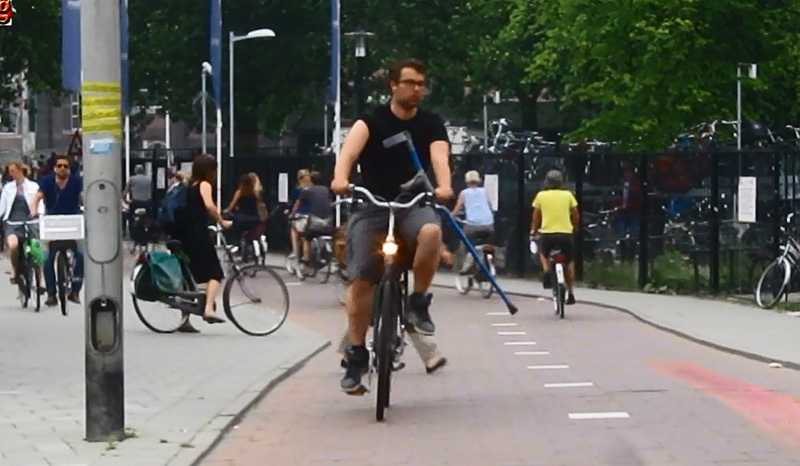 So this time I would like to show you again what morning rush hour is like in Utrecht. I filmed from one location for 20 minutes. In that time you can see all kinds of people going to work, to school and to their study location and of course they do so by bicycle. This is the busiest place in Utrecht when it comes to cycling: Smakkelaarsveld, the point where all Utrecht’s main cycle routes come together, right next to the Central Railway Station. I showed you this location before, but it looks different every year because of the ongoing building activities. This young boy is going faster than the rest of his family, that we can see in the distance. If walking is difficult, cycling can still be very possible. But for that walking this man brings a crutch. Of course it is not allowed to text while riding a bike, but girls will be girls. Young professionals going to work. Together on one bicycle. He looks slightly out of place but he doesn’t seem to have any problem with using this cycle path. She’s obviously dressed for work. Just sit back and relax while you see all these people rushing to their daily activities. 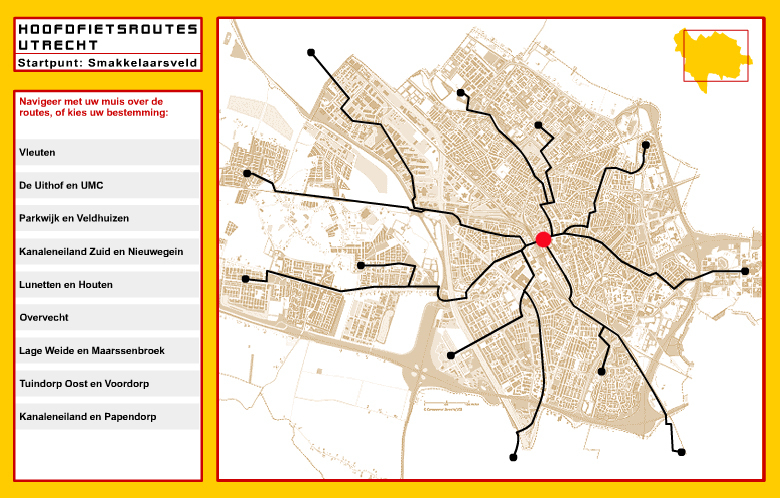 Map of the Utrecht cycle routes. The red dot is ‘Smakkelaarsveld”, the point where all routes come together. Whats the cycling infrastructure like in the new ‘vinex’ area of Leidsche Rijn. Just curious, as they are building a lot of residences there in a relatively short period of time. It’s all so quiet and civilised and efficient – no-one is held up on their journey for longer than a few seconds even though there are many crossing paths. 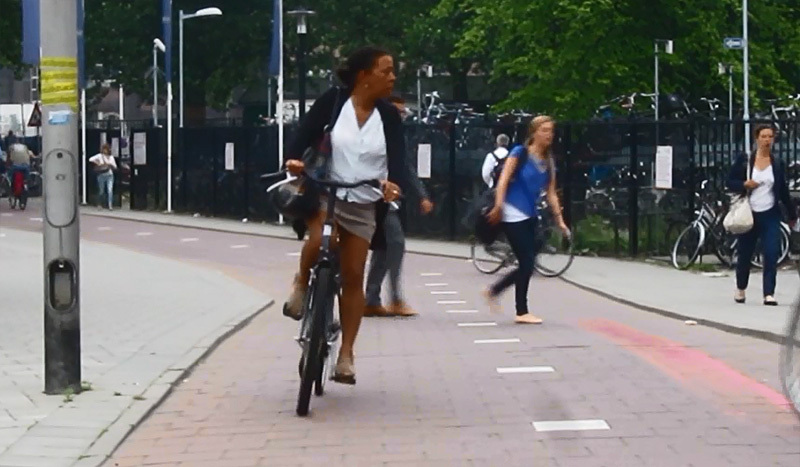 The high number of pedestrians crossing her is probably a bit overestimated from this video. A lot of them are coming from the guarded bicycle parking on the left side. These pedestrians are mostly carefully watching before they cross. I guess because they were cycling themselves moments before. 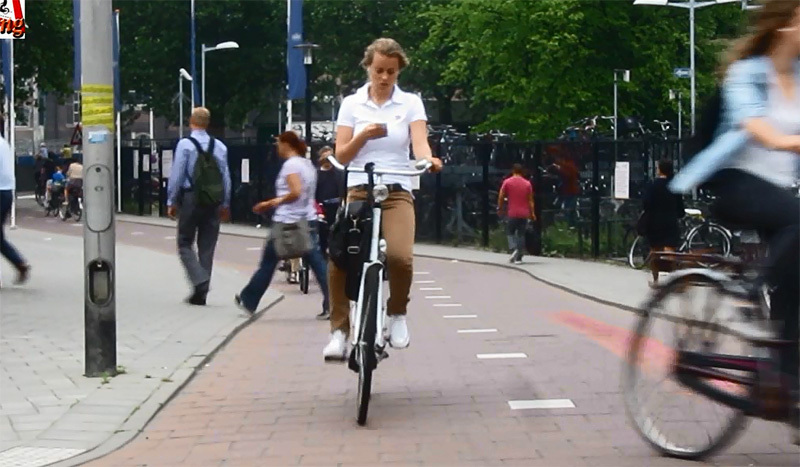 Texting on a bike is actually allowed. The law only says that you’re not allowed to hold a phone while driving a motorized vehicle. Of course that doesn’t make it a wise thing to hold one on a bicycle, but it’s not forbidden. There’s also a generic rule that you’re not allowed to cause danger or be a hindrance. That could theoretically apply but doesn’t really. Some celebrate this. Others are annoyed by how most people doing it are rather inattentive (there’s a shocker). Not that the mobile phone has a monopoly over inattentiveness; it’s a prominent factor but definitely not the only one. One fact is that bikes don’t pose as much of a danger to others as motor vehicles. I see motorized two wheels on Bike Paths. Are those allowed in Utrecht? 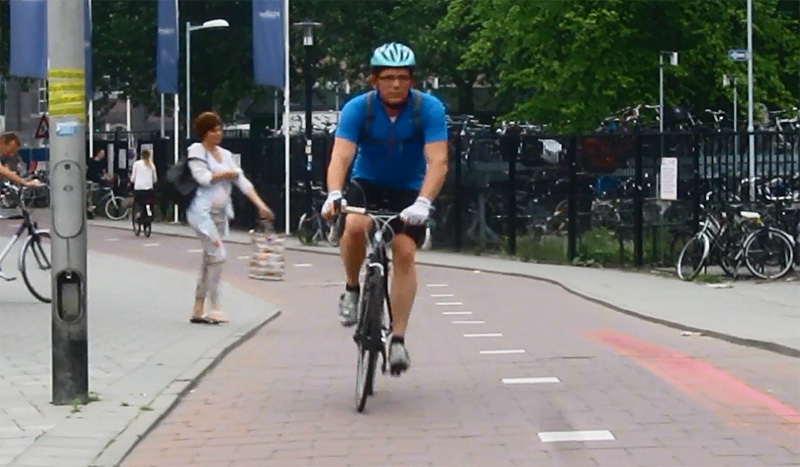 That gentleman in the peach shirt, at about 2:30, looked a little angry about almost colliding with a bicycle. Do collisions between pedestrians and bicycles happen very often? I’m assuming that bicycles have the right-of-way in this scene. At first I didn’t notice him because I was watching the slim blond girl in the black dress! But on review, it seems much more relaxed than trying to cross a carriageway between motor vehicles. Presumably the consequences of any collision between peds & cyclists must be less serious, bruises and grazes perhaps? A lot better than the 5 children under 16 who are killed or seriously injured on England’s roads every day, I would say. Are there any hills? If/when I ride to work (about 17km), there are various hills I need to climb. One in particular is more than 5% for about a kilometer. Does that kind of thing exist in Utrecht. No, Utrecht is in the large flat part of the Netherlands. The only height difference one is likely to meet is at bridges over large roads or waterways. There is a slightly hilly area to the northeast of Utrecht: the Utrechtse Heuvelrug or Utrecht Hill Ridge. It’s not very noteworthy, however. – The claim is rather generic. Most areas where people actually live and travel are pretty flat. – Some people commute across a mountain, so nobody will ever cycle anywhere? BS. It just makes that one particular trip less viable. – Most trips are short, i.e. quite doable even if you lack the stamina to tackle larger climbs. – There are hilly areas where people do cycle, much more than others do in many flat areas. – Headwinds are quite brutal on the flat. It’s equivalent to a slight to moderate incline, all the way! Unlike a predictable climb which is the same every time, this can seriously affect your trip from day to day. – We have many excuses not to cycle, too. Cars still dominate longer distances and are well catered for. 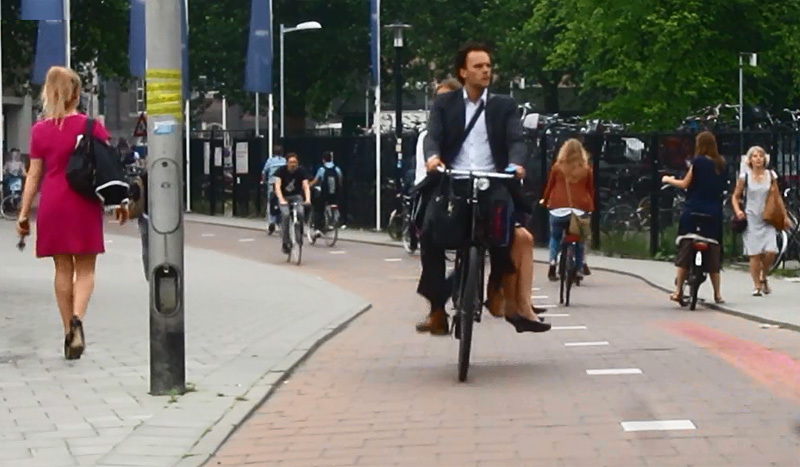 The idea that people either drive or must cycle everywhere all the time is a false dichotomy. It’s really just in city centers that driving is inconvenienced, simply because cars don’t fit! Tell that to the people who say there’s no space for cycling. I much prefer hills to headwinds when I’m cycling. Oh, we have many other problems to solve than a few hills. I’ve never been to the Netherlands, but I’d heard the cities are relatively flat places. Just wanted to confirm. You are tired of the “there are no hills” argument, and I’m tired of the “let’s build lots of facilities and bicycling will be just like it is in the Netherlands.” argument. Many of the facilities they build here in Melbourne make riding a bike more hazardous than it was before the facilities. Sure some novices are encouraged out on their bike, but they are at great risk of colliding with an open car door, for example – as statistics have shown. Automobile drivers are not sympathetic to bicycle riders, so the road use culture has got to change before people will really feel safe riding on the road. There are no corridors of land left to build a comprehensive, completely off road network of bike paths. Car use is not restricted, and there is an every present push to upgrade and improve car transport facilities, and bike facilities if added are an ill conceived afterthought at best. Mandatory helmet laws are a put off for many people who might consider riding a bicycle. Our cities are gradually getting more dense housing, but even so, the average distance traveled to work is about 10km. That is a short ride for me, but less attractive to wannabe bike commuters. Um, I know about headwinds. We had 40-50km/h northerly winds blowing at 7-8pm while I was out riding just 2 days ago. Inner city travel by bike is where it’s most practical. I firmly believe the reason London has had such a surge in bicycle use is because of the gradually increased difficulty (financial and physical) in using a car there. It’s something we can do here, but there is a lot of pressure to resist such change. My bet is there are plenty of corridors of land,but they’re currently occupied by roads for cars. 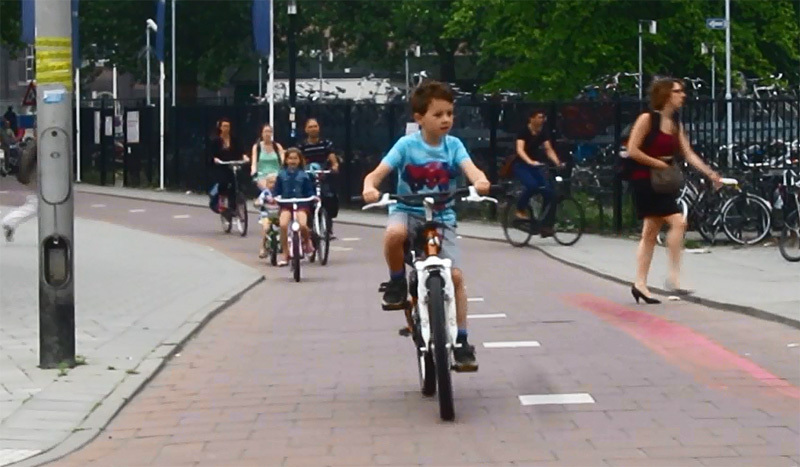 Why not transform a few roads into high-end bicycle infrastructure, forming a network of two-way bicycle tracks with priority over crossing roads? Perfect for casual and hasty cyclists alike! Cycling 10km or even more along such a route wouldn’t be a problem – in fact, it’s fun and relaxing. It can be done, as the situation in the Netherlands shows. 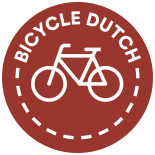 This entry was posted on 10 October 2013 by Bicycle Dutch in Original posts and tagged rush hour, Utrecht, watching people cycling.